The first time I had a broccoli salad was more than twenty years ago at my father's house. He had only cooked on two previous occasions (besides barbecue) in my entire life, but after my mother died he had to start cooking for himself. I don't recall how he came up with it--it wasn't something my mother had made--but his broccoli salad was really good and became one of his specialties for the rest of his life. This will tell you how much he didn't cook until he had to. I understand, married to the world's greatest cook, why cook? But my mother actually timed her outings around my father's meals on the days he wasn't working. One day she and I got a bit carried away in town and didn't make it back quite on time. Daddy had actually gone into the kitchen and made himself a ham and cheese sandwich. We got there just in time to see him take his first bite. He gave his head a little shake as if biting down on something "tough." Then he peeled back the top slice of bread to see what the deal was. We spotted the telltale glint of light on plastic. Turns out he had used an individually wrapped cheese slice without unwrapping it. It had been so many years since he had made a sandwich, he didn't know about such things. Needless to say, he was totally disgusted. So he had a lot to learn once he was on his own. His specialties were beef stew, pot roast and broccoli salad. We loved it, but I still can't quite bring myself to make it. When I do, I'll post it here because I'm sure you'll like it. In the meantime, here's a broccoli salad I just had for the first time at a big potluck dinner. Not having the recipe, I just wrote down what all I thought was in it and went from there. Since it came out really well, I'm sharing it with you. And, someday, I'll share Daddy's Broccoli Salad [added two years later] with you too! 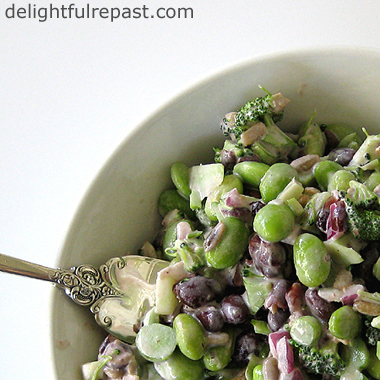 1 In 2-quart bowl, combine broccoli, beans, onion, sunflower seeds and cranberries. 2 In small bowl, whisk together remaining ingredients. 3 Stir dressing into salad. Cover and chill for at least 4 hours or overnight. Thanks, Judy! I do love to set a pretty table (and I work hard at my limited photography skills!). Yep, Daddy was a hoot! It's a wonder your aunt didn't set the kitchen on fire with her pizzas! Jean, did you take that photograph? It is very good. Apart from your obvious talent as a chef and cookery writer your pictures are pretty damn good. Have you heard about our problem over here with cucumbers? The European Common Market is a single economic entity so we share everything, we sell each everything. Cucumbers, we get ours from Spain, have been tested for the e-coli bacteria because people have been becoming ill eating them. We have to wash all our fruit end vegetables very carefully. It's always been a good idea to wash fresh produce but we have to be extra careful at the moment. There has been some problem with the water supply in Spain. i think in the future, with global warming and the difficulties with growing crops in the equatorial regions increasing,, we will be returning to a more self sufficient food model. Tony, thank you! Yes, I take all my own photos for the blog. I'm new at it and want to keep learning all I can. Yes, I've heard about the cucumber problem. But I hadn't heard about the problem with the water supply in Spain. I have long been a proponent of eating locally and seasonally, so I wait patiently each year for the seasonal foods in my area. For example, no peaches from South America in January for me. Are those cranberries or cranraisins in the recipe? They are dried organic cranberries, packaged by my local health foods store, not a national brand. I'd like a large serving, and one to go! Must apologise!! It isn't the water supply in Spain causing the e-coli outbreak. It originated in Germany.Scientists are not sure of it's cause at the moment.It could possibly be the use of cow dung as mmanure.. Forms of the e-coli bacteris live bennignlly in the guts of cows. However, it is interesting to know that e-colli is around us all the time in various non serious forms. eat should be cooked,, vegetablle swashed etc and we stay healthy.This straiin of e-coli has only been found in rare instances before and is extremely virulent. But, to put into perspective we have eleven cases here in Britain. All are being treated in hospital. They have all recently returned from holidaying in Germany. There is no evidence of it being transferred between humans. What was the famous quote from, Hill Street Blues? "Now take care out there." I think that was it. Loved that series.Must have been the title music or something. Thanks for the info, Tony. There have been E. coli outbreaks over here as well from time to time. I've been fortunate to have never been affected, perhaps because I'm a "germaphobe" and wash the living daylights out of everything! Even when I buy packages of prewashed lettuces that say "Washed three times. No need to wash again." And I always peel any produce that has been waxed (such as many cucumbers and apples)--I figure it probably wasn't washed to my specifications before it was waxed and the wax is just protecting the germs from my careful washing! I love the ingredients in this salad,especially the cranberries. This would make a fantastic summer dinner. Thanks, Meghan! I plan to have it a lot this summer. Maile, thank you. I'm glad you like it. Yes, you may submit it for the cookbook you described, credited as Jean at Delightful Repast, http://delightfulrepast.blogspot.com. Maile, do let me know the outcome! 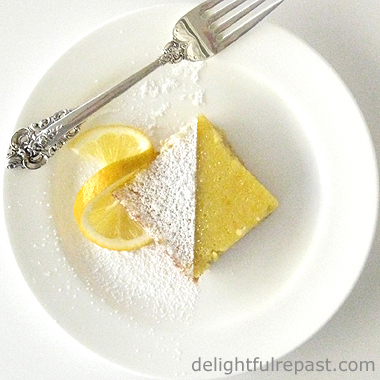 I clicked over here from Daddy's version (9 repeats of the same dish, oh my!) and confess I really like the idea of the extra beans/edamame here. Plus, although I try not to overdo "creamy" salads, I feel like broccoli is so noble, it's ok to liven it up a bit. Looking forward to trying this! Thanks, Pauline! I love your idea of broccoli as "so noble, it's OK to liven it up a bit"! I hope you like it as much as we do. It's always a hit wherever I take it.